First of all: Merry Christmas everyone! The reoccurring themes this Christmas have been the colour white and snowy scenery, as well as using the colour red. 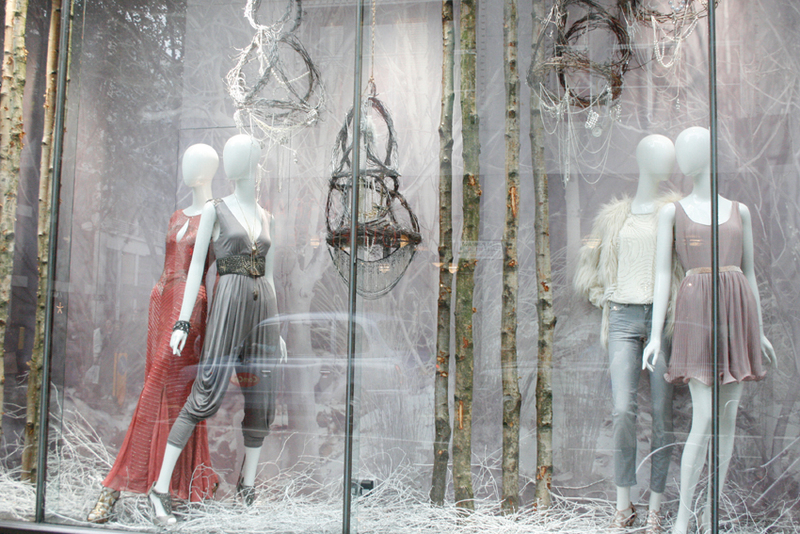 Perhaps the snow we had last year inspired the look of the festive windows this year. And how appropriate it was with all the snow again this winter. Here I look at what the high street retailers created for their shoppers, I say created because most of these windows don’t appear on the streets no more as it is, once again, sale time. 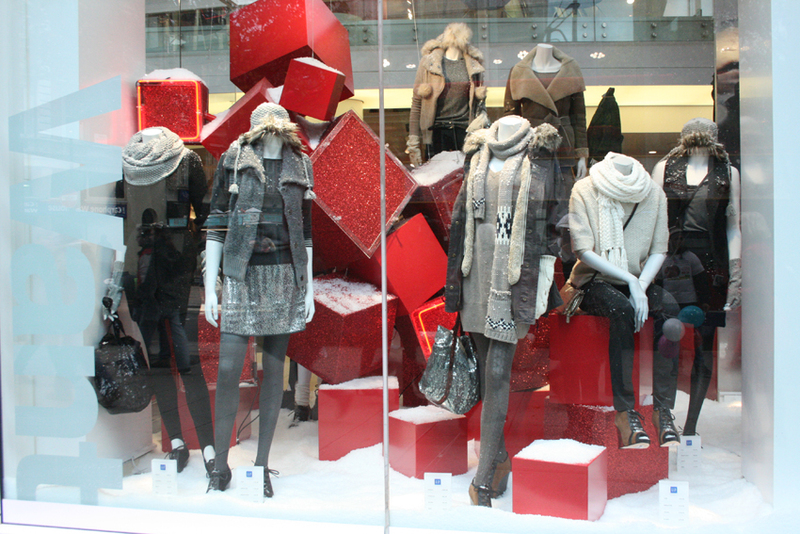 TopShop, Oxford street Christmas windows have a lovely colour scheme of whites, silvers and camels. 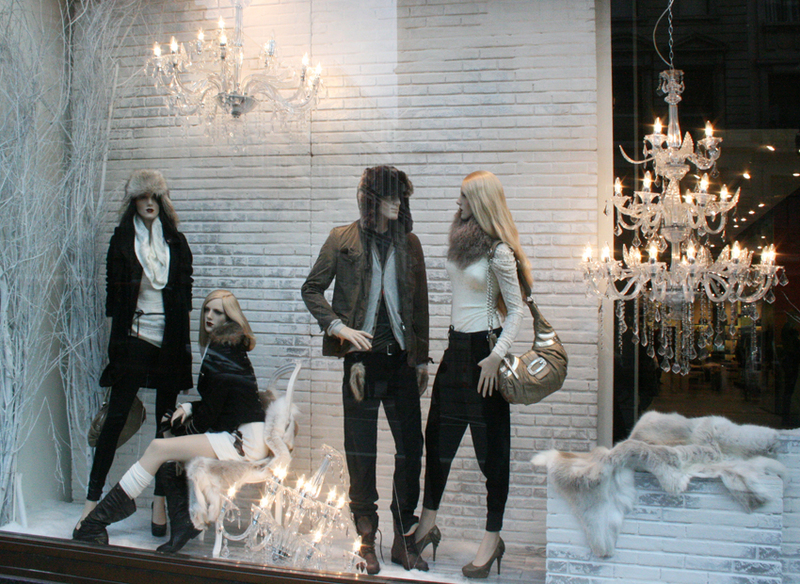 Brilliantly styled fashion window! Loving the mannequins inside the bauble..
Debenhams, Oxford street would like you to dream of perfect presents. 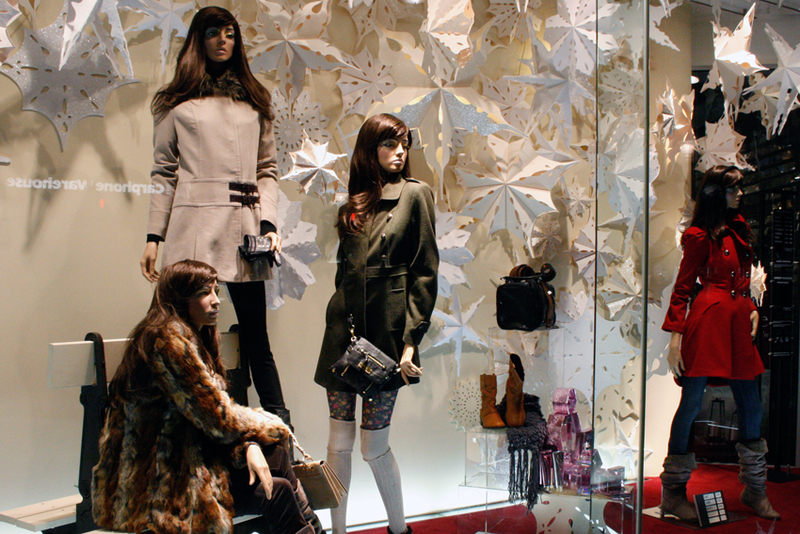 Snow on the ground and large lit snowflakes are the key features in these fashion windows. 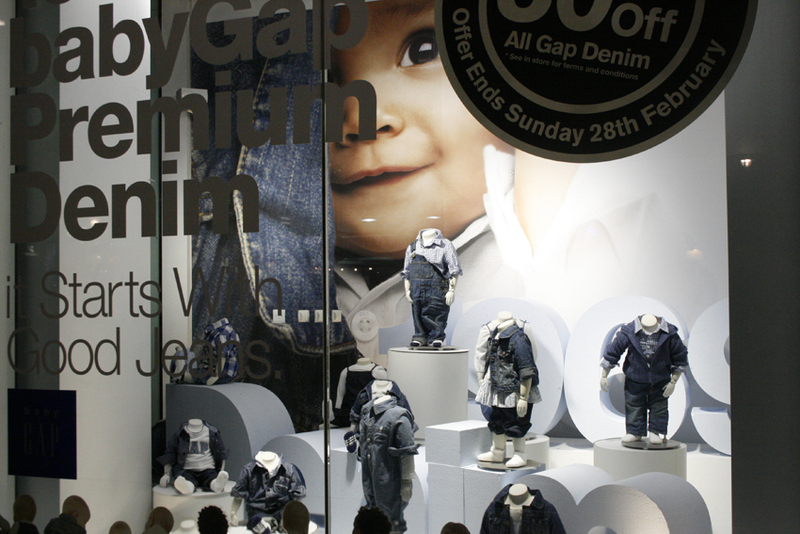 Gap, Oxford Street. The white snowy look is contrasted with red glittery presents. Next, Oxford Street. I like the use of paper snowflakes here. They remind me of my childhood ! 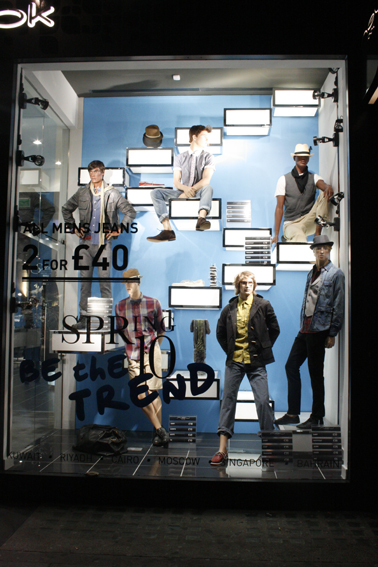 I am introducing trend reports, in which I will look at specific areas of window display whether it is mannequin styling,Â seasonal display trends; shapes, colours or materials, or purely just looking at how different stores have approach fashion or decorating trends. Or something.. It’s all experimental this blogging business Anyway this report is about denim, which is being heavily promoted in stores every spring, and quite often you will find good offers. This spring stores are keeping colours simple: just using classic blue jeans with white and maybe some grey. Or doing just that but adding one bright colour is popular approach too. 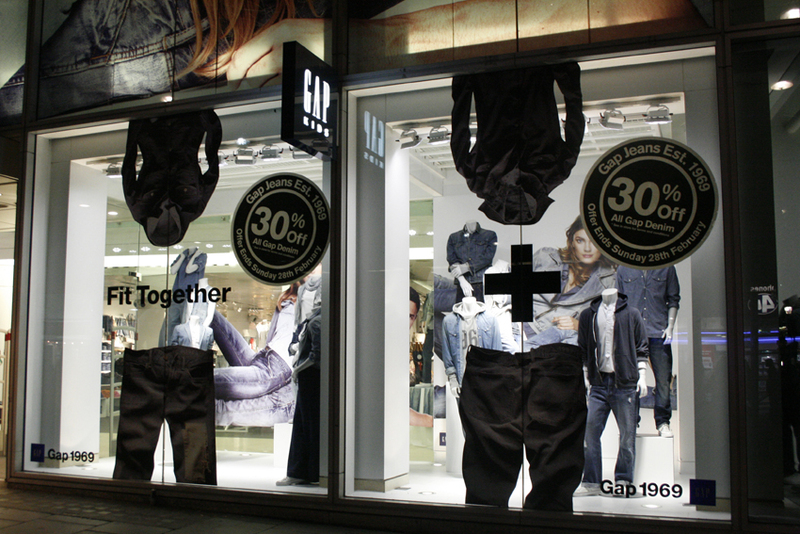 Gap has being doing denim just over 40 years and their jeans are pretty good.Â Sorry their offer is not on anymore (I’ve being too slow posting..). Other than promoting the offer their fashion statement is to wear denim with denim. Can be a tricky style to pull off.. I like the denim flag pennants. 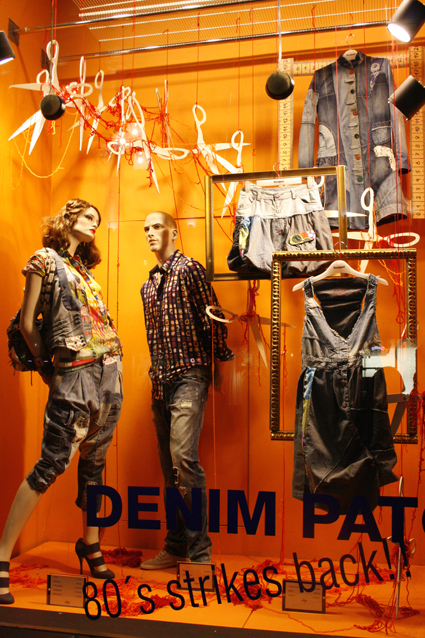 Esprit: styled mannequins as well as jeans hanging from the ceiling with orange pegs. 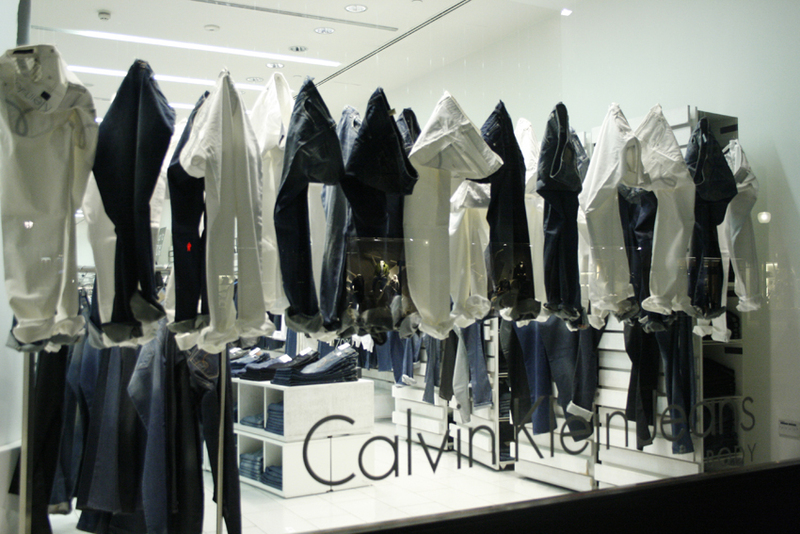 Calvin Klein Jeans, window just using nylon to hang loads of blue and white denim. Simple but effective? I would like to see more of the fit of the jeans. 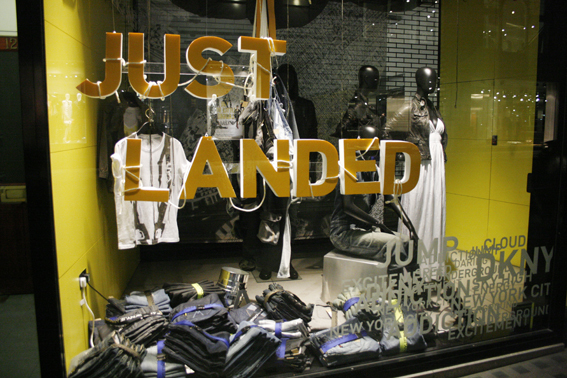 New Look, a promotional window for specific denim on offer. 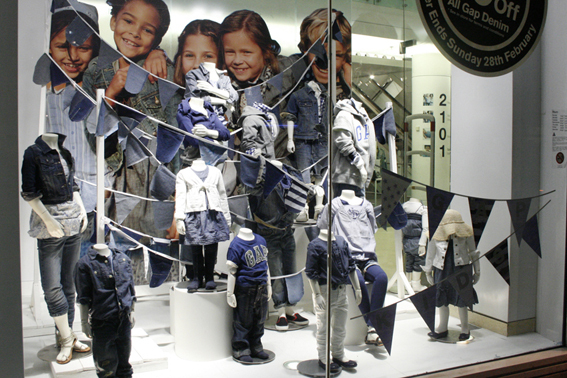 Young fashion brand Bershka are also using the classic denim colours: blues, whites and some grey. Now I have to admit that I can’t remember who this window belongs to.. i am sure I wrote it when I was taking the pic, but on some random piece of paper, go figure. But it’s on Regent Street. Here is the use of brights with denim I mentioned earlier, and quite a few elements: frames, measuring tapes, and scissors. All of which refer to customizing? New York yellow has landed into London. 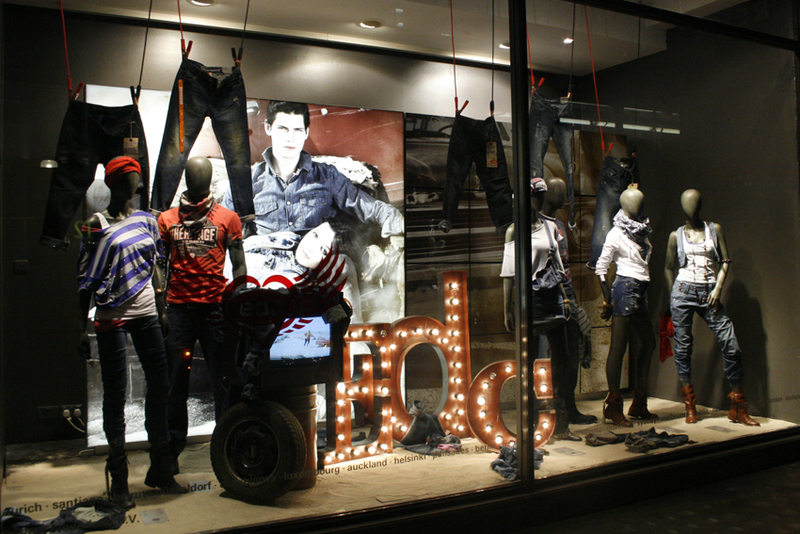 Denim with belts around them, I like the unorganised piles that the jeans are in and the letters with wire around them.